This is a guest post by Humphrey Nabimanya, founder of Reach a Hand Uganda. Joseph Kato is a writer with The Daily Monitor, one of Uganda's leading newspapers. Like some of his fellow journalists, he has been writing about reproductive health issues for a while. But he sometimes hesitates. Like many other writers, he has a lot of unanswered questions. "You can't give me teenage pregnancy statistics this month and give me the same statistics again for the next four consecutive months! How do I convince my editor to publish them every time?" If you are a journalist or an editor, this might sound familiar, especially in Uganda. Many media personnel shy away from reporting about reproductive issues in their media houses simply because "they are repetitive and not well-explained," as Joseph noted. 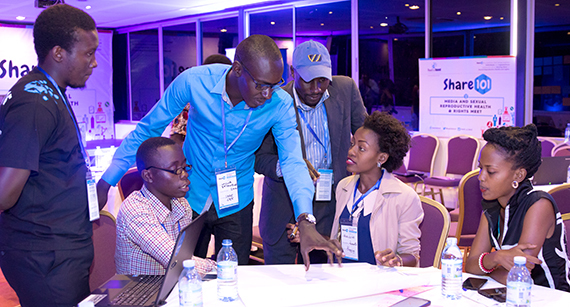 With support from partners like Segal Family Foundation, MTV Staying Alive Foundation, and Rutgers, this was what Reach A Hand Uganda was trying to assess with its inaugural Share101 forum. As a youth-led non-profit, Reach a Hand focuses on youth empowerment programs with an emphasis on sexual and reproductive health and rights and HIV/AIDS awareness and prevention. 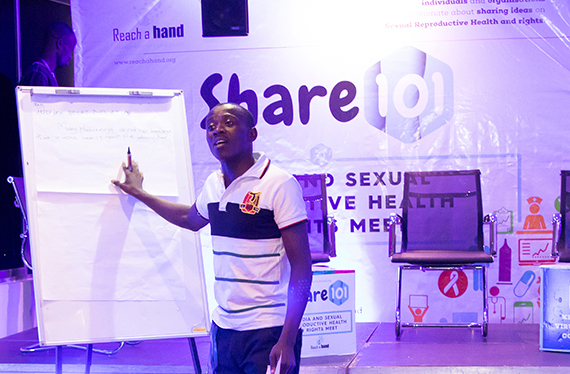 Share101 is a forum that brings together individuals and organizations passionate about sharing ideas on sexual and reproductive health. The inaugural event sought to enhance journalists' and bloggers' interest and motivation for reporting on sexual and reproductive health issues, while also establishing relationships between the media and sexual and reproductive health advocates. According to the 2011 Uganda Demographic Health Survey, 24% of girls aged 15 to 19 are already mothers or pregnant with their first child. This implies that one out of every four girls aged 15 to 19 is pregnant or has already had a child. In Uganda, most people go to high school when they are 14 or 15. And this study is from five years ago. When it comes to maternal health--specifically abortion--Duncan Musumba, the Strategic Communications Manager at Uganda Health Marketing Group, stated that 16 women die every day while attempting to abort. To put this into perspective, imagine a full 14-seater commuter taxi with passengers dying in an accident every day. That's the rate at which pregnant women die every day while attempting to abort in Sub-Saharan Africa! Thus, it is important to note that even though the mass media have excellent potential to promote good sexual and reproductive health outcomes around the world, it often fails to prioritize such issues or report them in an accurate and deeply analytical manner. "The media plays a vital role in telling these stories to galvanize governmental and non-governmental support on issues related to reproductive health, by continually raising public awareness to a targeted audience such as policymakers, program implementers, and other key stakeholders," explained Joy Asasira, Programme Manager at CEHURD. Consequently, by promoting openness and public discussions, the media can help break the culture of silence and stigma associated with reproductive health issues. "How you deal with statistics creates an understanding in the minds of people. Break it down and make it relatable to the reader," advised Mona Herbet, Country Director from DSW Uganda. 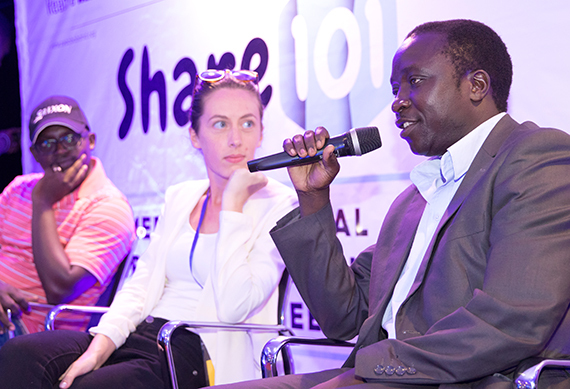 As Joseph Kato explained to fellow journalists during the Share101 media forum: "Move out of the city and go to in the rural communities, because that is where real stories about the impact of reproductive health are found." Joseph believes that when journalists cover these stories, it's then that they can get the experience to write thoughtful articles on reproductive health. Kato believes journalists should not be at a receiving end of stories through press releases, but should instead go the extra mile to visit rural communities to get firsthand information about the reproductive health issues affecting young people and women. Humphrey Nabimanya is a young SRHR and HIV activist, with a passion for young people. He started Reach A Hand Uganda to empower youth with information and skills regarding their sexual health and rights. An alum of Makerere University and a peer educator with "World Starts With Me," he believes in developing skills and positive attitudes towards the lives of young people. Humphrey loves to talk about issues that affect young people. For more information, contact him at humphrey@reachahand.org.